The company was started in the year 2011, with a sole mission of satisfying the vast demand of auto motive spare parts. The company currently stocks Genuine Parts of Toyota, Subaru, Nissan, Mitsubishi, Honda, Suzuki and Isuzu parts. The company currently enjoys an average clientele base that comprises of Aviation Industry, Non-Governmental Organization (NGO's), Spare Parts shops, Garages and walk in clients. To become the leading provider of auto parts, consulting services in automobile solutions. We endeavor to see "realization of the automobile solutions to assist driving vision 2030 achieved at all levels"
Our mission is to provide quality and timely services to our customers by focusing on productivity, profitability, customer care, competitiveness and continuous process improvement in a rapidly changing business environment. 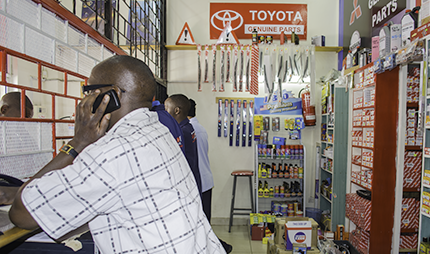 We are networked with various manufactures abroad to ensure complete and genuine parts are available to our clients both locally and upcountry markets. SafeZone Auto Parts Ltd provides customers with a wide range of genuine and replacement parts for engine transmission, suspension, electrical and body parts for major models of Japanese vehicles, this includes but not limited to Toyota, Nissan, Mitsubishi, Honda, Subaru and Isuzu. Our total commitment is geared towards total customer satisfaction, profitability, competitiveness, Staff Job Satisfaction, Quality Enhancement, and Productivity Improvement, effective information technology and strategic management culture. Our approach emphasizes close collaboration with our clients. Our main aim is to establish our presence in both Regional and National levels and become a leader in automobile industry. 3. Professional internal capability and readiness to respond to customer needs.